Last year, Arrow star Stephen Amell participated in WWE's SummerSlam with a match that was highly anticipated. Now, the actor is returning the favor, bringing in Former WWE SuperStar Cody Rhodes (FKA Stardust) for a guest appearance in Season 5. The actor announced the guest starring role during a Wrestling Rivals appearance at the Heroes & Villains FanFest this weekend held at the Meadowlands Exposition Center in Secaucus, N.J.
Cody Rhodes left the WWE in May of this year, and is now seeking a career in acting, as many former WWE superstars have done before him. Stephen Amell told a standing room only crowd that Rhodes will appear in the third episode of this new season. Rhodes appeared alongside the Arrow star, and had this to say to all the fans in attendance according to TVLine. "You can probably expect Stephen and I to get into another fight." 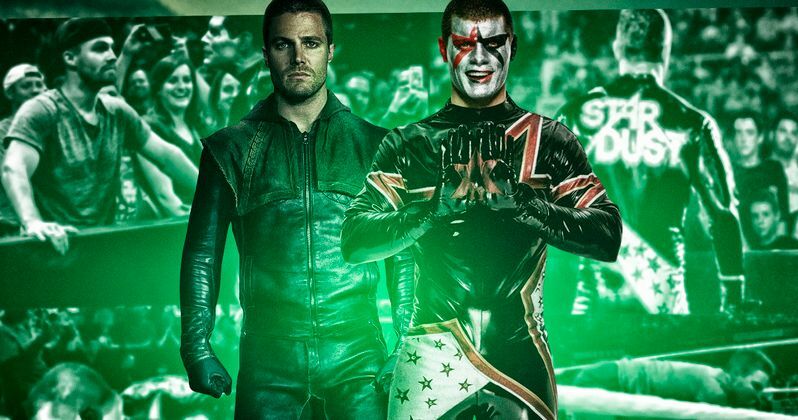 Cody Rhodes' role in Arrow Season 5 was not immediately revealed. And it appears that may be kept under warps for the time being. In real life, Rhodes and Amell are 'rivals' in the ring. Their heated and very contentious relationship escalated last August when Stephen appeared on Monday Night RAW as a spectator. He was poked and prodded into an 'illegal' fight with WWE wrestler Stardust. It wasn't until weeks later that Amell and Rhodes had a proper face-off in the ring during SummerSlam. Amell appeared on the pay-per-view event as part of a tag team alongside Neville and King Barrett. The good guys, of which Amell is considered one in the WWE, left the ring victorious. Rhodes isn't bringing the only new character to Arrow Season 5. There are a number of others lined-up as well. Carly Pope, best known for her role on Popular, will appear as a Coast City reporter, Chicago P.D. 's Josh Segarra has a series-regular role as D.A. Adrian Chase, aka Vigilante, And Reaper star Rick Gonzalez takes on the roles of DC Comics character Wild Dog. Also appearing in new episodes this fall are The Walking Dead's Chad L. Coleman as villain Tobias Church and The McCarthys' Tyler Ritter as SCPD Detective Malone. Arrow is set to return for its most exciting season yet on October 5th at 8/7 central. It will lead into the new CW series Frequency, which is based on the time travel drama of the same name from 2000 that starred Dennis Quaid and Jim Caviezel.